Hugs & Kisses... Make it Last! Wow. Has it already been a year? I ran across this pic while tackling the #2 item on my new year's resolution list - BE MORE ORGANIZED (with #1 resolution being - STOP CURSING!). It was called a "Hugs and Kisses" bouquet. Get it? 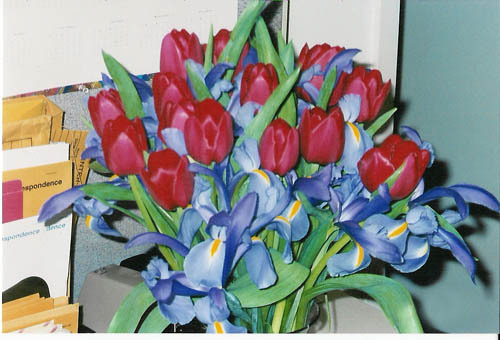 (tulips = hugs, irises = kisses). Before displaying cut flowers, snip the stems at a forty-five-degree angle under water. (If the blooms come in a water-filled vase, you can skip this step.) This allows the stems to draw up more water than if they were resting flat against the vase. Use sharp pruners. Never snap stems by hand. Strip blooms of any foliage that would fall below the waterline in the vase. Leaves decay when they're submerged, encouraging algae and bacteria that can cause th flowers to deteriorate more quickly. Place flowers in a clean vase filled with lukewarm water. Add cut-flower food, available from florists, to the water. This will nourish the stems and help them absorb water. Check frequently to make sure the ends of the stems are covered in water. Change the water and recut the stems every five days or when the water begins to look cloudy. One way you can prolong the life of an arrangment is by setting it in the refrigerator at night - but do this only if the fridge is free of fruit. Ethylene gas, emitted from fruit, will cause flowers to decline faster. Happy new year. 2007? Ha! That was sooo 2700 years ago. It's year 4705 - the Year of the Pig. 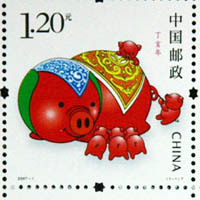 Technically, Chinese New Year doesn’t begin until February 18, 2007, but as soon as I saw pictures of this stamp, I couldn’t wait to post it. If you were born in 1923, 1935, 1947, 1959, 1971, 1983 or 1995 - you were born under the zodiac sign of the pig. Like the pig, you are highly regarded for your chivalry and pureness of heart, and you often make friends for life. Famous pigs: Porky (WB cartoon character), Wilbur (protagonist, Charlotte’s Web), Miss Piggy (Muppet character) and Babe (protagonist, 1995 movie). Famous people born in the Year Of The Pig include Lucille Ball, Humphrey Bogart, Thomas Jefferson, Ernest Hemingway, Alfred Hitchcock, Mahalia Jackson, David Letterman, and Arnold Schwarzenegger. This page contains all entries posted to veronicafung.com in February 2007. They are listed from oldest to newest.